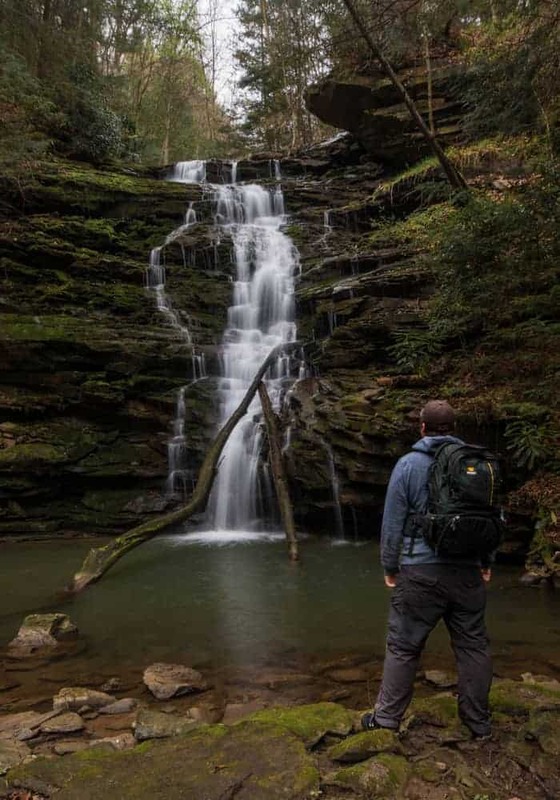 There are hundreds of waterfalls hidden away in Pennsylvania’s woods visited only by locals or the few intrepid people willing to follow scant directions to find them. Yoder Falls near Johnstown is one of these waterfalls. Yoder Falls is located on land that belongs to the City of Johnstown. Despite this, it is located in Somerset County, not Cambria County. This parcel of hillside land abutting the Stony Creek River was donated to the city in 1915 by Peter Carpenter, a local businessman. Known as Carpenter Park, the land was the site of a small amusement park. 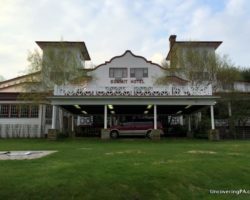 Serviced by trolleys from both Johnstown and Paint, Carpenter Park had a dance pavilion, a picnic area, and was popular with those looking to cool off from the summer heat. Another popular activity during the early 20th century was hiking to Yoder Falls. Staring up at the beauty of Yoder Falls. After the 1936 flood, the trolley line was abandoned, and it’s likely that Carpenter Park closed at the same time. 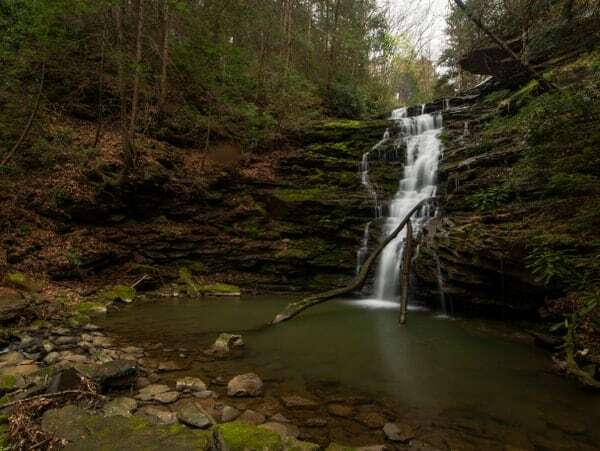 Over the years, the property has returned to nature, hiding away the beautiful Yoder Falls. It took me two attempts to find Yoder Falls. Despite knowing where the parking area was located thanks to some online directions, I could not find the promised trail to the waterfall. 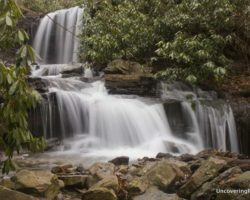 During my first visit, I was forced to give up, but during a second visit to the area, I was determined to find Yoder Falls. After a bit of searching, including bushwhacking through the hillside’s underbrush, I eventually found the trail to Yoder Falls. The trail to Yoder Falls. While the first 5 feet or so of the trailhead is very overgrown, the rest of the trail is quite easy to follow the third of a mile or so downhill to Stony Creek River. Make sure to take your time on this trail as it is quite steep, descending around 200 feet into the valley below in that distance. 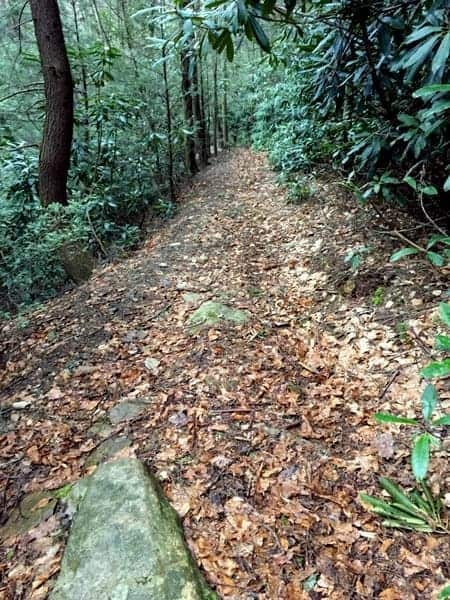 The trail is very lightly trafficked and is covered with leaves, this adds to the slipperiness, and hides the rocks and roots along the trail. Along the way down the trail, especially when there are no leaves on the trees, you’ll have great views of the McNally Bridge, which carries Route 219 nearly 200 feet above the valley floor. You may also be able to see Yoder Falls to your left. Unfortunately, there’s no easy way to get to the falls from this point. 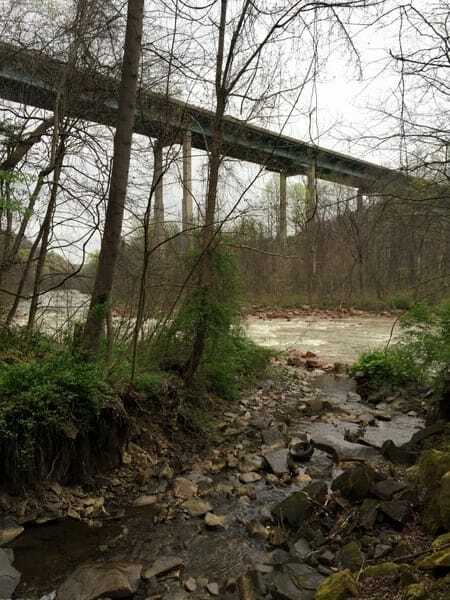 The trail ends at the Stony Creek River with great views of the McNally Bridge. At the bottom of the valley, you’ll come to Stony Creek River. Head to the left, and you’ll immediately see the unnamed creek which feeds Yoder Falls. Notice the stone walls on opposite sides of the creek. 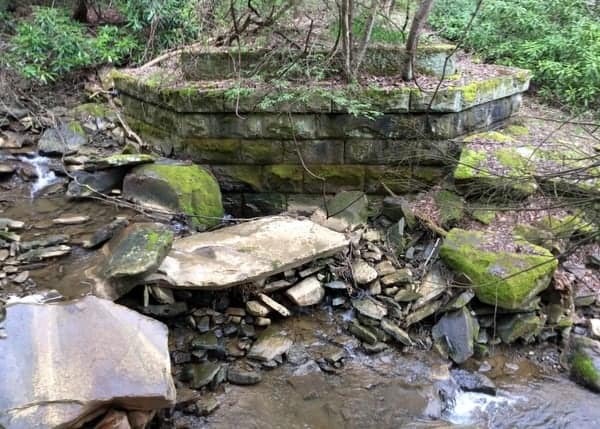 These are the ruins of a bridge that once carried the trolley from Johnstown to Carpenter Park and Windber. The stone ruins of the bridge that once carried trolleys over the creek. If you do opt to tackle the hike to Yoder Falls, make sure you are wearing proper footwear, ready to get wet, and have plenty of time. Also, don’t go alone. If you were to get injured here, it might be days or weeks before someone else comes along. A bit of an idea of what an easy part of the hike to Yoder Falls looks like. If you’re still with me, you’re in for a very beautiful and isolated hike. Yoder Falls is only about a quarter-mile upstream of the stream’s confluence with Stony Creek River. Keep in mind that hiking a quarter-mile upstream through a creek takes a lot longer than hiking on a regular trail. I’d give yourself at least 15 minutes to reach the main falls, if not a bit longer. 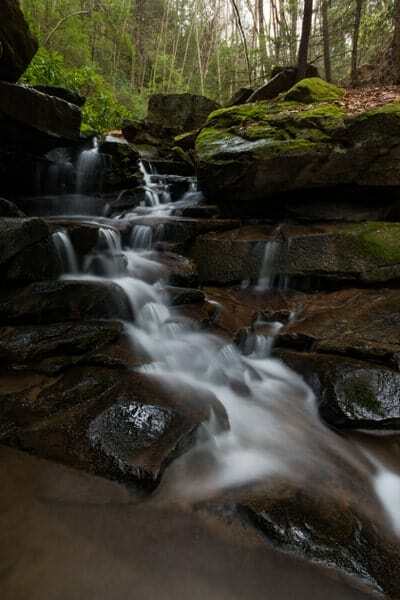 Along the way, this unnamed creek flows over rocks and through two smaller waterfalls. One of these is a small series of steps, while the other is a beautiful drop of about 10 feet through a narrow chasm in the rocks. The larger of two small falls on the way to Yoder Falls. Climbing up above this waterfall is one of the hardest parts of the hike as the rocks here are very large. However, just a short distance above this drop you’ll find Yoder Falls. 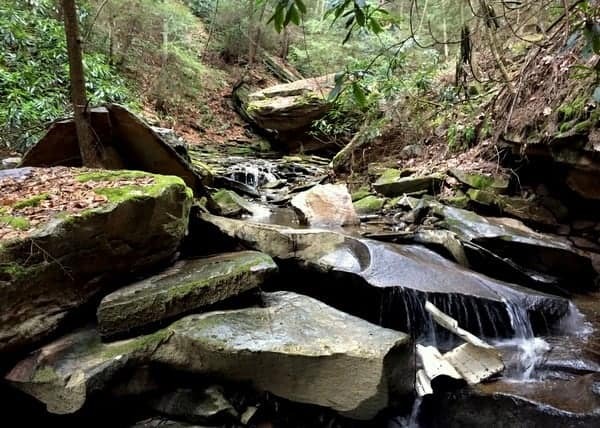 Yoder Falls is one of the most beautiful hidden falls in Pennsylvania. Roughly 35 feet in height, water cascades into a beautiful pool after passing over a series of steps in the rock. Yoder Falls is located in a dark hollow. Unfortunately there is a lot of trash around this basin and along the way up the creek. However, given the location of this waterfall and its lack of visitors, I can only assume that it’s from debris washed downstream as opposed to litterbugs at the falls. 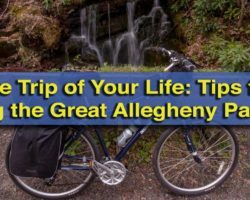 After enjoying Yoder Falls, make your way back downstream to the confluence with the river, and then head back up the steep trail to your car. The smaller of two waterfalls seen on the way to Yoder Falls. It is a (potentially) dangerous adventure getting to Yoder Falls near Johnstown. 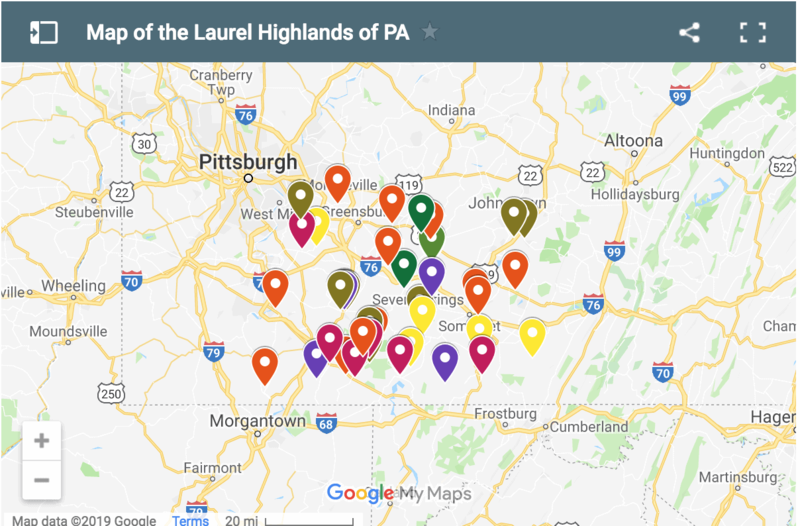 However, for those up for the challenge, it is an adventure that ends with the chance to see one of the most beautiful waterfalls in Pennsylvania. Another look at Yoder Falls. 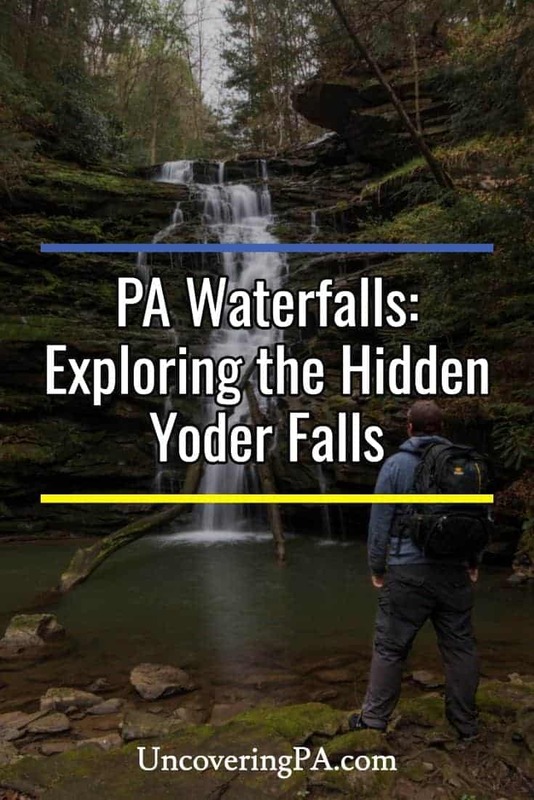 Yoder Falls is located near Route 219 in Conemaugh Township in Somerset County, PA, about 20 minutes from downtown Johnstown. There are two parking areas located along Carpenter Park Road. Park at the one furthest from the bridge over Route 219. It can be found at the following coordinates: 40.247336, -78.892396. The trailhead is nearly impossible to see, but does leave from the parking area. 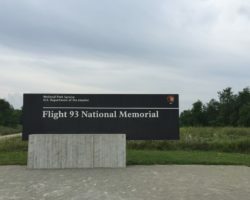 If you are standing in the middle of the gravel parking area, with your back to the road, the trail is located in roughly the 10 o’clock position. If you get more than about 10 feet into the woods and haven’t found the obvious trail, you’re in the wrong spot. 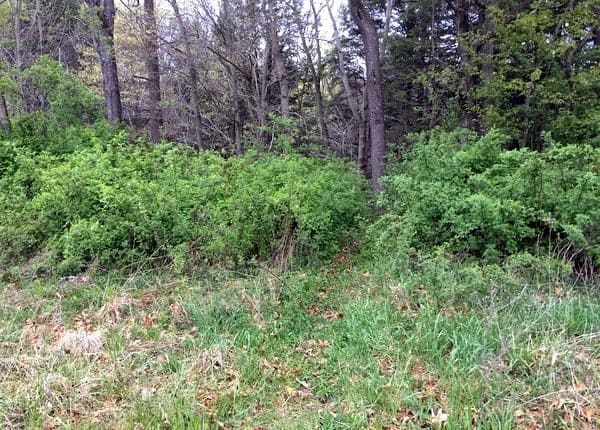 The trailhead can barely be made out through the underbrush. Follow the trail to the Stony Creek River, turn left, and walk up the unnamed stream here. 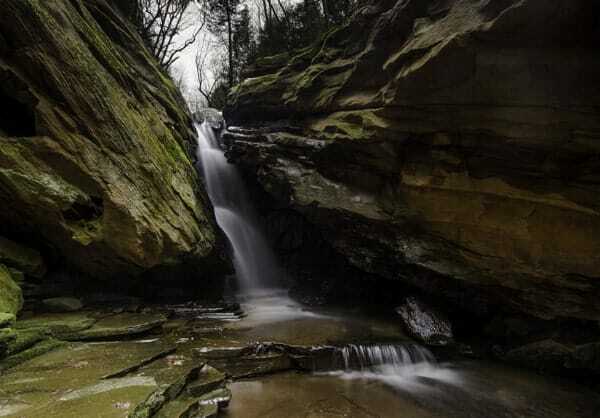 Yoder Falls is located at approximately the following coordinates: 40.248605, -78.892332. According to my sources and to the best of my knowledge, this entire hike, including the parking area, are located on land owned by the City of Johnstown. However, there are no signs whatsoever to indicate this. Should any signs pop up in the future indicating that this is private property, please respect them. Again, remember that this is an off-trail hike. The stream is slippery and you will have to cross it several times and hoist yourself up car-sized boulders to reach the falls. If you opt to tackle this adventure, use extreme caution and don’t go alone. 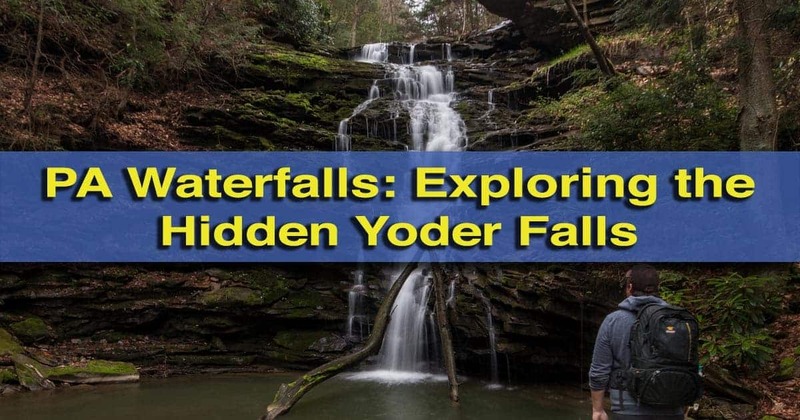 For those that might not be able to make the journey, check out the short video below of Yoder Falls near Johnstown. 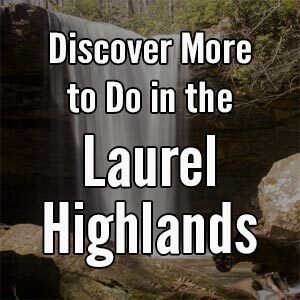 Looking for more places to explore in the area? 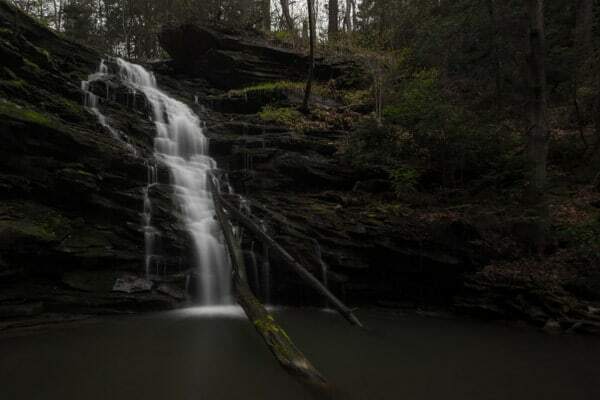 Check out the roadside Hinkston Run Falls north of Johnstown. Is the pool under the falls swim-able? No idea. I didn’t check the depth while I was there. I’d be very careful for trash, though. A lot has been washed down from upstream, and I’d be surprised if it wasn’t filled with junk.